Arranging music for easy piano involves starting with the very simplest case and gradually moving up. While the original key is in G major and later modulates to A major, it is much easier to play in the white key of C major. I started with the simplest version using both hands to play the melody. The left hand position stays the same throughout, but the right hand has a slight maneuver in bars 8 and 16. In measure 8, the right finger needs to change from 2 to 1 while holding down the key. Later in measure 16, the reverse is true —- the right index finger replaces the thumb on the same key. The trick is to write at the right level of difficulty so the student doesn’t get frustrated. To cater to the different levels in my group piano classes, I have to write different versions. The next hardest is to have the right hand play only the melody and the left hand play a simple bass line. I chose to include some parallel motions and imitations. One of my students who plays the ukelele has expressed his wish to play more chords. That’s the third version — chord names and simple chords for the left hand. 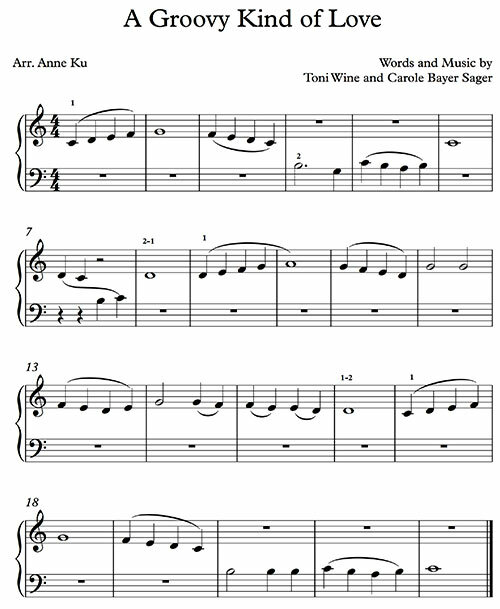 To encourage everyone to play together, I’ve arranged a fourth version with the melody in a small staff (ossia) to guide the players who play arpeggios from left to right. Their assignment for this upcoming three day weekend is to transpose the music to its original key of G major so they can play with the official video. Now that will be a fun thing to do for the Earth Day Jam on April 22nd! 2. The tune and harmonies are taken almost directly from a piano piece by Clementi [ his Sonatina Op. 36, No. 5, 3rd movement (Rondo) ] which was written in the late 1790’s. It is cheeky (to say the least) of Wine and Seger to claim it for themselves.